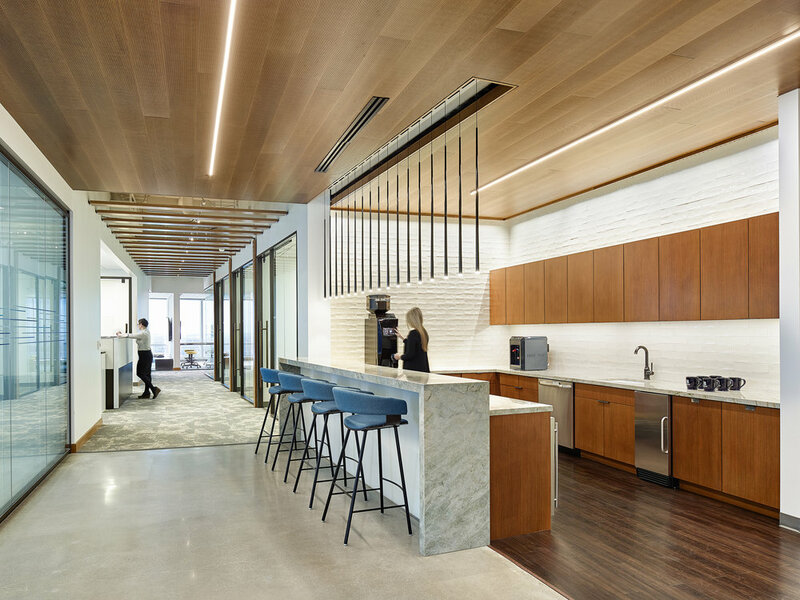 Brandywine Realty Trust’s corporate headquarters strikes a delicate balance between strength and elegance with bold, powerful forms rendered from exquisite natural materials. When Brandywine Realty Trust, a real estate company that designs, builds and maintains extraordinary and sustainable work environments, decided to move their headquarters to the heart of Philadelphia, Center City’s state-of-the-art FMC Tower offered the perfect setting for Brandywine to cultivate a fully immersive branded experience. The company’s 40,000-SF bi-level office is nothing short of stunning—upon entry, visitors encounter a reception area complete with floor-to-ceiling windows showcasing panoramic skyline views. An elegant staircase runs parallel to a two-story glass curtain, which creates a strong connection to an inviting central hub. The space feels polished yet cozy: A large interactive media wall displaying the company’s impressive portfolio is juxtaposed alongside residential-style seating and a welcoming fireplace. Concrete, glass and metal materials are offset by warm woods and plush fabrics and carpeting, fostering an atmosphere of connectivity, community and engagement.